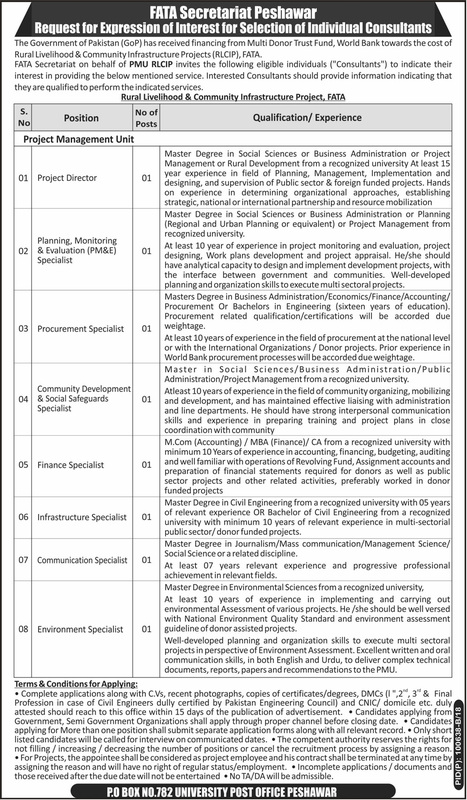 FATA Secretariat on behalf of PMU RLCIP invites the following eligible individuals (Consultants) to indicate their interest in providing the below mentioned services for the Project Rural Livelihood & Community Infrastructure FATA. These Jobs are published in Daily Mashriq Newspaper 21-03-2018. Interested Consultants Can Apply for Jobs in FATA 2018 and should provide information indicating that they are qualified to perform the indicated services. Following Positions are Vacant Project Director, Planning, Monitoring & Evaluation Specialists, Procurement Specialist, Community Development & Social Safeguards Specialists, Finance Specialists, Infrastructure Specialists, Communication Specialists and Environmental Specialist. FATA Secretariat 08 New Jobs Daily Mashriq Newspaper 21 March 2018.